The Swiss Cottage Inns Motel is located in Niagara Falls, New York, only a few minutes from the Niagara Falls, Seneca Niagara Casino and is 24 miles from Buffalo-Niagara International Airport. Local attractions include downtown Buffalo, all the attractions around the Falls and the tourist district of Niagara Falls, Ontario, including Clifton Hill, Fun at the Falls. Hotel amenities include an outdoor swimming pool, free wireless Internet access, free shuttles to the falls and casino, and sightseeing tours. Guest rooms feature cable TVs, and telephones. Microwaves and refrigerators are available upon request. The Swiss Cottage Inns are located in the heart of Niagara Falls, USA and only minutes from great shopping, dining and attractions located in the surrounding area. 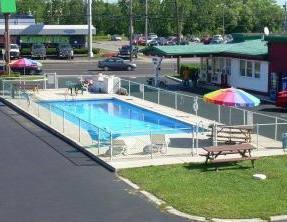 This Niagara Falls Motel is AAA Approved and offers guests with Free Wireless Internet, Free Shuttles to the Falls and the Casino, and a large outdoor pool. All 31 guestrooms feature either a Queen Bed or 2/3 Double Beds in every room along with full cable television, in-room telephones and air conditioning.